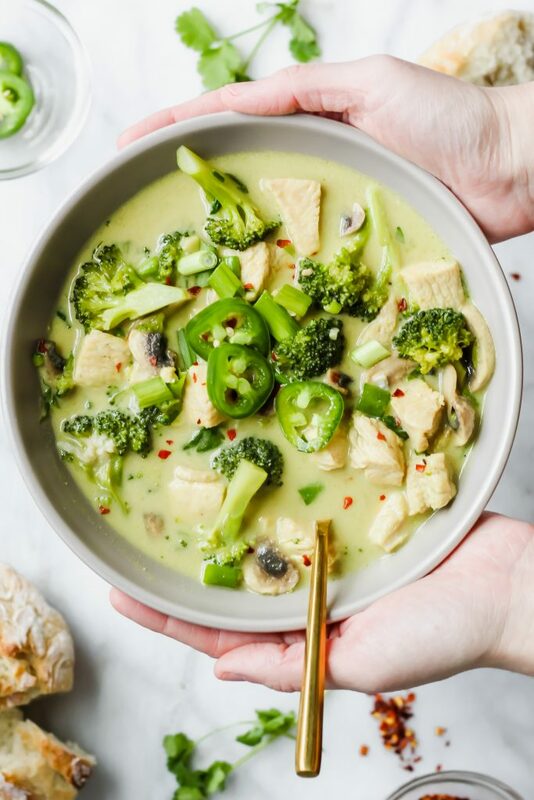 This Thai Green Curry Chicken Soup is loaded with spicy Thai green curry paste, fresh green vegetables and is the perfect nourishing, healthy but mainly delicious soup! Out of all vegetables, green vegetables are my favorite. I love greens, bell peppers, green onions, asparagus, brussel sprouts…but if I had to choose, my all time favorite is broccoli. I will eat it raw with ranch dressing, roasted with caramelization bits or just sauteed. With all of this love going towards green vegetables, I knew I wanted to do a soup with it this Winter. It wasn’t until I found the green curry paste on sale at the grocery store (I’m all about a bargain, y’all!) that I knew exactly what type of soup I wanted to do. And thus, the Thai Green Curry Chicken Soup was born! 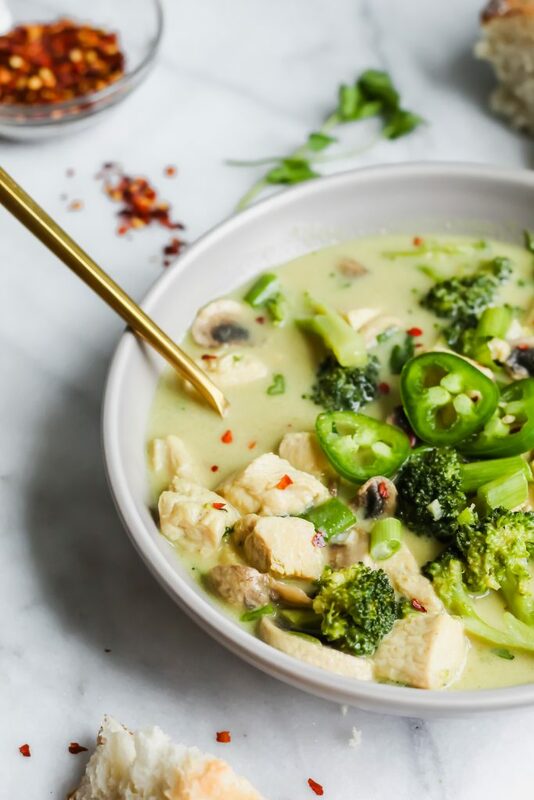 I debated on calling it “Thai Green Goddess Curry Chicken Soup.” Yes, I know Green Goddess is a trendy term. No, I don’t care. I totally felt like a goddess while eating this delicious bowl of nourishing goodness! I even asked my husband and he said he also felt like a Green Goddess. Yup, it’s that good. 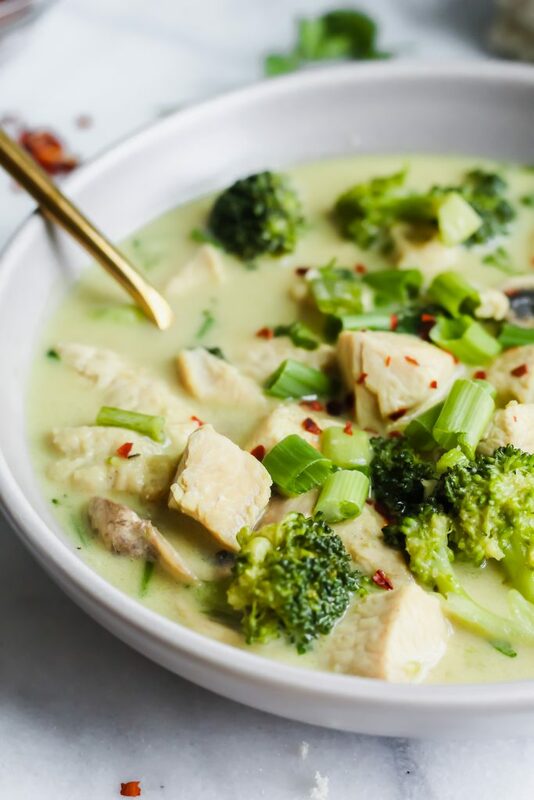 This Thai Green Curry Chicken Soup is so fresh, vibrant and delicious. 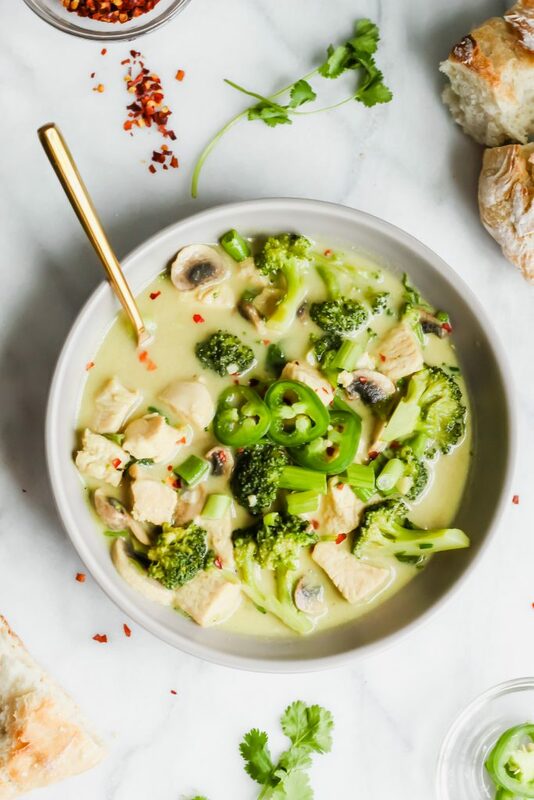 With the combination of the coconut milk and the chicken stock as the base, it’s the perfect blend of creamy (but not overwhelmingly so) mixed with the delicious savoriness of the chicken stock. The broccoli gets slightly soft but still retains a crunch, the green onions and cilantro help flavor the broth SO much. Not to mention, I swear, as I was eating this – I declared this was a type of flu fighting soup. I felt my sinuses were cleared out with fresh ginger and garlic that is experienced in almost every bite. SO MUCH GOODNESS. It’s slurpable – like to the point where you just put down your spoon, pick up the bowl and slurp it down like it’s the leftover milk in cereal. Let me tell you how to make it! It’s super easy. As always, I find it much easier to just begin to prep all of your vegetables before hand. Go ahead and mince the garlic and the ginger. Slice your mushrooms, chop the broccoli into florets and then chop them in half (to make them smaller!) and then finally, dice the green onions and cilantro. Whew! 5 minutes later, we done! Lastly, chop the chicken breast into about 1 inch cubes. In a large pot or dutch oven, I added a tbsp of olive oil and placed the stove eye on medium heat. When it is heated, add in the chicken breast and season it with a great big pinch of salt and pepper. Cook, stirring occasionally, until it’s cooked through (takes about 5 minutes or so). Once it’s all done, add in the garlic and ginger and cook until it is fragrant – about 1 minute. Next, add in the Thai green curry paste! Make sure to incorporate it to where it’s basically coating the chicken. Add in your fish sauce as well and try not to freak out like I did because it does, in fact, smell like FISH SAUCE. Cook that for another minute or so. To that mixture, add in the can of FULL FAT coconut milk and chicken stock. Add salt and pepper to taste and then bring it to a boil. Let it boil for about 1 minute or so and then reduce the heat down to low/simmer. Let it simmer for about 15-20 minutes. Halfway through the simmering, add in the broccoli and mushrooms. They will cook in the broth. When the soup only has a couple minutes left of simmering time left, add in the chopped cilantro and green onions and a squeeze of lime. From there, as always, taste and adjust the seasoning as needed! AND THEN IT’S DONE! You’re finally ready to have a big ol’ bowl of nourishing soup that will make your body and heart feel good at the same time. So warming, cozy and delicious! Slurp it up and enjoy! To Make Vegetarian/Vegan: Substitute the chicken broth for vegetable broth. Skip the fish sauce and ditch the chicken. Add additional vegetables if desired! For some extra deliciousness: Add in rice or rice noodles! With white rice, add in the soup at the beginning of the simmer cook time. Cook until rice is done. With rice noodles, I would recommend cooking those separately and then adding them into the soup once it’s done simmering and ready to be enjoyed in a bowl! Enjoy this recipe? Here a few more you might like! optional: jalapenos for a spicy kick! Start with getting the veggies prepped. Mince the garlic, dice the ginger, slice the mushrooms. Chop your broccoli into florets and then cut them in half to make them even smaller. Dice your green onions and cilantro. Set all this aside. Dice the chicken breast into 1 inch chunks. In a large pot or dutch oven, add in the olive oil on medium heat. Once heated, add in the chicken breast with a large pinch of salt and pepper. Cook until done, about 5 minutes or so. Add the garlic and ginger to the pot and cook for 1 minute. To the same pot, add the green curry paste and fish sauce. Make sure it gets fully incorporated with the chicken. Cook for 1 more minute, until fragrant. Next, add in the can of coconut milk and the chicken stock. Stir around, add salt and pepper to taste and bring it to a boil. Let it boil for about 1 minute, stirring consistently and then reduce the heat to low/simmer. Let simmer, uncovered, for 15-20 minutes. About halfway through that time, add in the broccoli and the mushrooms and mix. When the soup is almost done simmering, add in the green onions, cilantro and juice of the lime. Taste and adjust seasoning if needed. Enjoy while warm! To add noodles or rice to the soup, refer to the substitutions above in the blog post. As always, the more time you let a soup simmer, the more flavorful it is. 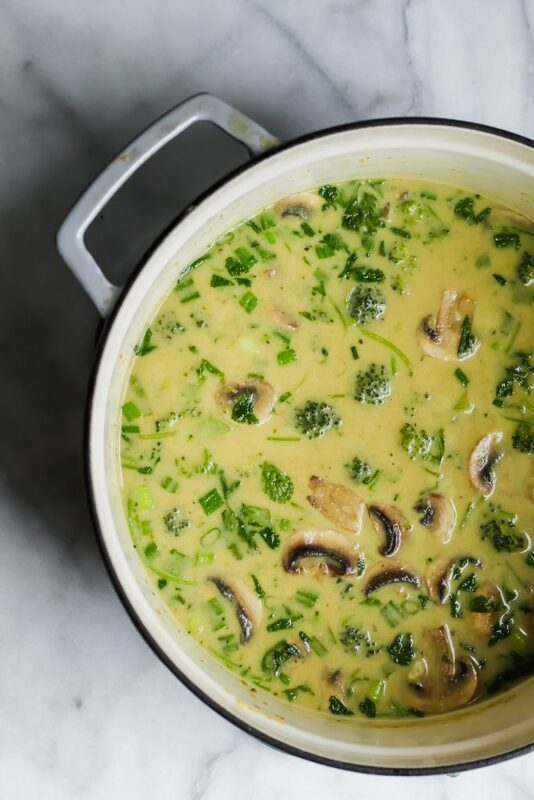 This soup is especially good for leftovers - when all of the flavors have had extra time to meld together! Haylie, I tried this one too. I’d give it 10 stars if I could. Fantastic! Hank, that makes me so happy! I’m so glad you enjoyed this one as well! This would definitely make my bod feel good! Love me some green veg too, especially hubby, so they are ALWAYS stocked in our fridge. Green goddess or whatever you call it, I call it dang delicious!! And curry anything is my jam. Getting this one on the menu soon, Haylie…and with this cold weather, I definitely need it! Have an awesome weekend!! Yes!!! Most of our grocery haul is usually green haha! And yes – this spicy curry will definitely warm you up! Happy weekend, Dawn! Hope you have an awesome one and enjoy the Superbowl if you’re watching!! We made this last night and got a big thumbs up from my husband (and me)! It was delicious and lent itself well to adaptation (I didn’t have broccoli, so used spinach, which I added right before serving). We threw in some rice noodles and a pinch of coconut sugar for that little sweet that Thai food likes to get just right with the sour/sweet/spicy/salty. Delicious! I usually make red curry meals, but this one was a perfect way to change that up! Denise! Yay! This review made me so happy! So glad you enjoyed it and that it was easily adaptable to what you had (which is my hope for all of my recipes!) 🙂 Thanks again! SO good! My husband told me that this is the best soup he’s ever had! I loved how creamy the coconut milk made it. We added cooked brown rice noodles at the end for some tasty carbs! When would you recommend adding the jalapeños? 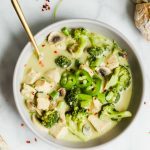 A winner – I added more broccoli and another tin of coconut milk to feed 4 and not a drop was left over. I made it earlier and it was even better when reheated.Next time I will also add some green beans. Thank you very much Haylie!